The ExoMars mission launching Monday (March 14) will pack an orbiter as well as an ambitious Mars lander prototype that will make the challenging descent to a controlled landing on Mars. The little lander, called Schiaparelli, will demonstrate the technology necessary to land a life-hunting rover on ExoMars' next mission. It's about 1,320 pounds (600 kilograms) packed into a 7.9-foot (2.4 meter) diameter package, counting the outstretched heat shield. A few hours away from the Martian atmosphere, at an altitude of 76 miles (122.5 km), the module will come to life while traveling approximately 13,050 mph (21,000 kph). Its heat shields will slow it down as it enters the atmosphere, braking to about 1,025 mph (1,650 kph), and then it will deploy the 39-foot (12 m) parachute. This infographic explains the planned landing of ExoMars 2016. As it hurtles downward, Schiaparelli's heat shields will reach temperatures of about 2,732 degrees Fahrenheit (1,500 degrees Celsius). 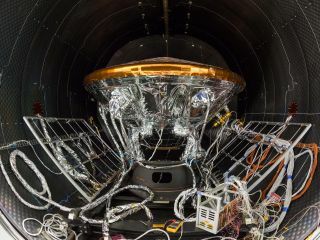 After slowing even further, the experimental lander will release its front and back heat shields and switch on radar sensors to figure out how far it is from the Martian surface. The parachute will be left behind on the back heat shield, so to slow down even more, the lander will switch on its thrusters until it gets down to about 6.6 feet (2m) off the ground, slowed to just 4.3 mph (7 kph). Then it'll switch off its thrusters and drop to the ground, and the bottom of the module, like the crumple zone on the front of a car, will break its fall as it plunks down on the surface of Mars' Meridiani Planum, possibly within view of NASA's Opportunity rover. A lot for the lander to get through in just 6 minutes since entering the atmosphere. The ExoMars 2016 entry, descent, and landing demonstrator module, also known as Schiaparelli, will touch down on Meridiani Planum, a relatively smooth, flat region on Mars, on October 19, 2016. The lowest areas on this map are shown in green, while the highest areas are dark brown. The large crater on the right (East) of the image is Endeavour, which is about 14 miles (22 kilometers) in diameter. Opportunity has been studying its western rim since 2011. Any science measurements the lander sends from the surface is a bonus: The lander's main purpose is to pave the way for the rover launching in 2018, officials said in the statement. Using knowledge gained from Schiaparelli, that future rover will be able to land safely and begin its hunt for signs of life.